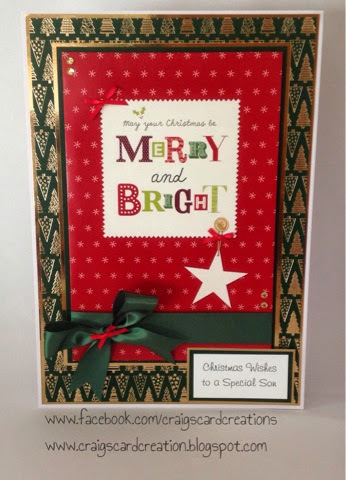 Crafting With Craig: Recycled A4 Christmas card using Hunkydory. Recycled A4 Christmas card using Hunkydory. I am determined to raise as much money for charity this year especially at Christmas time. So by watching my costs I am recycling old Christmas cards into brand new gorgeous ones that I can sell to raise more money for my dogs trust and Crohn's and colitis charity. The main image of this card was A5 which I cut down slightly and used an A4 card blank to make a large card. Love how an old used "basic" Christmas card can be turned into a a lovely special card. A4 foiled tree background card. A4 dark green Adorable Scorable. 25mm green satin ribbon - American Crafts. 3mm red satin ribbon - American Crafts. Thank you hazel. Love info doing this just now. "A pocket full of posies" 8x8 card. "Chocolate Delight" Willy Wonka 8x8 card. "All my love" Radiant Roses A4 card. "Let the Christmas delivery commence" card. 2nd Indigo Blu 8x8 Christmas Card. Indigo Blu 8x8 Christmas card. Hunkydory chocolate lover 8x8 card.